Did you know that anxiety is the most common mental “disorder” in the United States? In fact, 40 million adults (or 18% of the population) suffer from it. Social anxiety holds a special place in this list, affecting 15 million people or 6.8% of the population. If we delve into the causes of this phenomenon, it’s not a surprise that so many people nowadays are afraid of social situations to the point that it becomes a problem. In our society full of prejudices and biases, it can be difficult sometimes to become socially accepted, especially if you are in some way different from others. Thus, the disorder evolves from the fear of being judged or embarrassed by others and, in certain cases, can even lead to extreme conditions like paranoia or schizophrenia. However, despite the fact that social anxiety can be harsh and make one’s everyday life difficult, it also has some unexpected benefits. According to recent studies, those who suffer from anxiety seem to have high IQ levels and enhanced empathic abilities. A study at Lakehead University aimed to assess verbal-linguistic ability showed that participants with general anxiety had a higher score on verbal intelligence tests than those who did not report suffering from anxiety. Another study at the SUNY Downstate Medical Centre in NYC concluded that people who suffered from severe anxiety had higher IQ levels than those who did not. Furthermore, researchers from the University of Haifa’s Department of Psychology, Haifa, Israel, studied the empathy tendencies of people with social anxiety and found “elevated mentalizing and empathic abilities”.This means that those who suffered from this disorder had higher psycho-social awareness and thus showed “sensitivity and attentiveness to other people’s states of mind.” In other words, socially anxious people may be so sensitive to other people’s emotions that they find it really hard to be engaged in social interactions, which are too devastating for them. You can read more about the link between social anxiety and being an empath in one of my previous articles. As for high levels of intelligence, there is an explanation as well. Basically, socially anxious people have a higher awareness of the surrounding environment and people because they are constantly analyzing and reflecting on what is going on around them, which arises from their fear of being judged and rejected by others. As they see dangers which are actually not there, they process information and stimuli in a different way and are able to notice things which other people are not aware of. These continuous cognitive processes result in a fact that their mind never rests, which certainly requires (and leads to) high levels of intelligence. In a similar way that “ignorance is bliss,” it can be said that awareness is torture. Indeed, being sensitive to and aware of everything and everyone can be overwhelming, and the mind, seeking to protect itself from this intense experience, creates this kind of mental “disorder”, by societies standard. 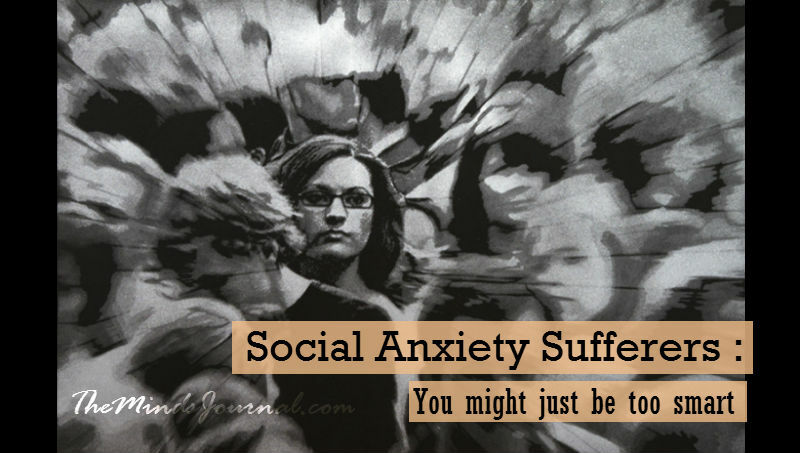 But if you look at it from a different perspective, social anxiety is actually a gift. Being aware also means being highly intuitive and able to predict situations and behaviors before they occur, which is certainly an advantage. So, if you suffer from social anxiety, consider thinking of it as a gift and a special talent rather than a mental disorder. Jonathan Beresford Who are you to ‘judge’. Your level of intelligence is reflected in your language !! !